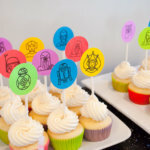 Making Star Wars cupcakes for a Star Wars birthday party? 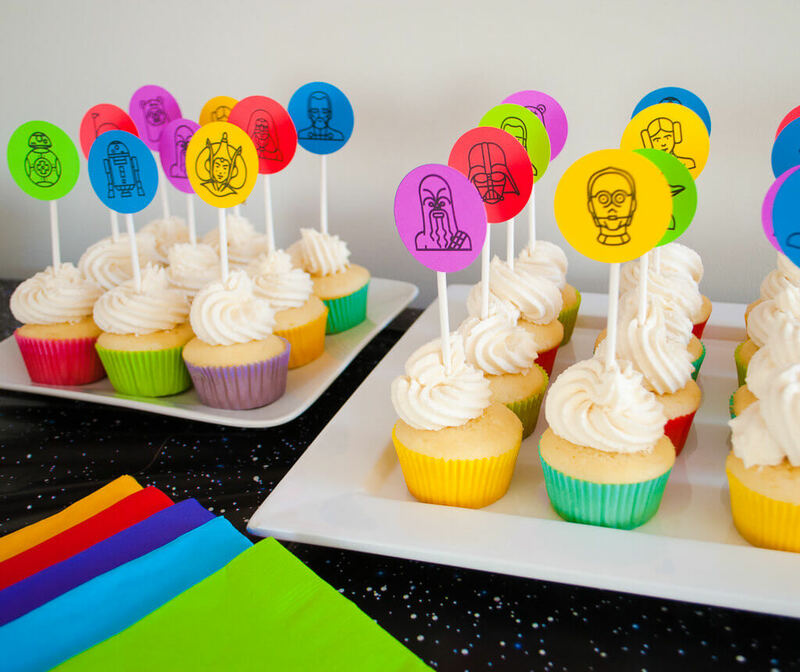 Top them with these free printable Star Wars cupcake toppers in colorful lightsaber colors. 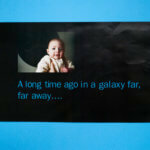 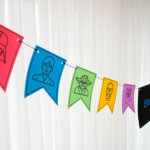 Who says Star Wars party decorations must be just black and white?? 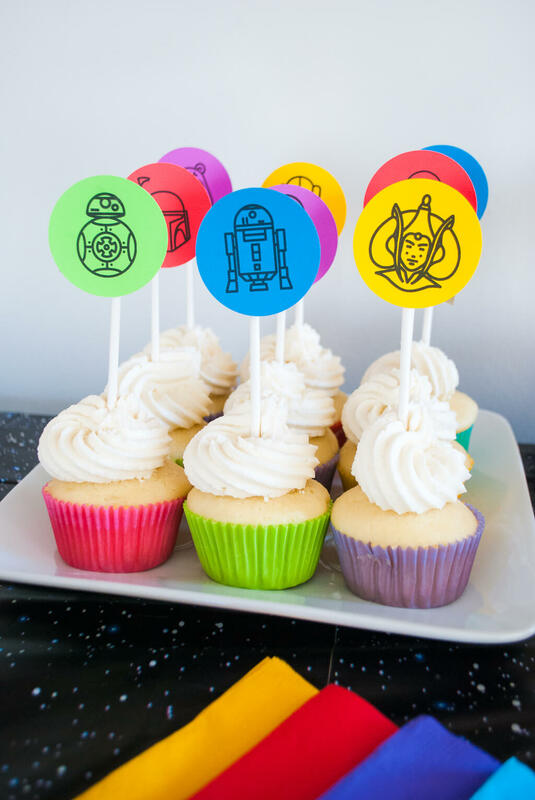 We decorated Elise’s 6th birthday party theme — “Episode VI: Return of the Birthday” — with these yummy Star Wars cupcakes in blue, red, green and purple, plus yellow. 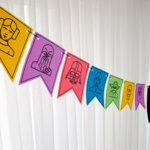 My printable Star Wars birthday banner comes with lots of characters using icons from Freepik made by flaticon. 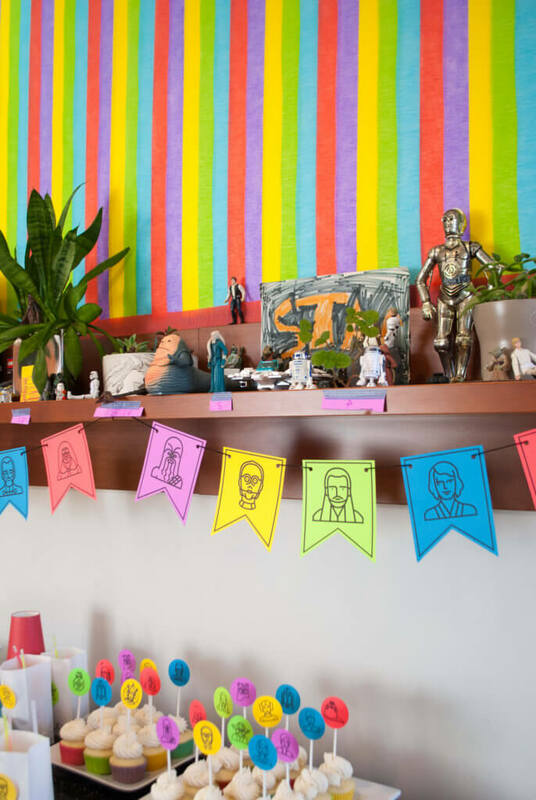 I know, I know, the only Force Awakens character is BB-8. 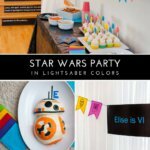 We actually held this Star Wars birthday party in October 2016 so we only included BB-8. 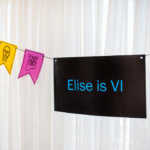 I may add Rey, Finn, Poe and Kylo Ren in the future but my Star Wars crush is still solidly Episodes 4/5/6. 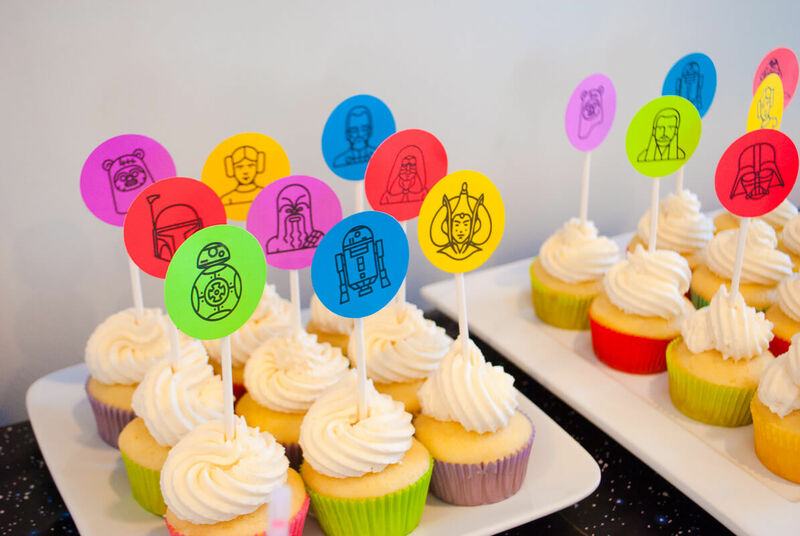 Print them on colored paper to top your Star Wars cupcakes. 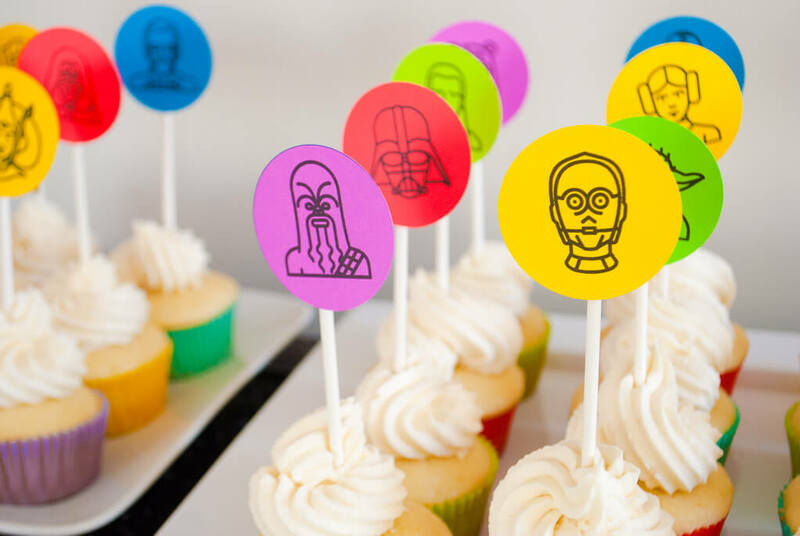 Print my free Star Wars cupcake toppers onto colorful card stock paper. 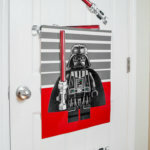 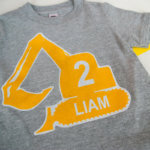 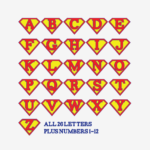 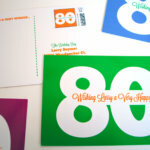 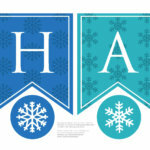 You’ll print them at the same time as my printable Star Wars banner to save paper. 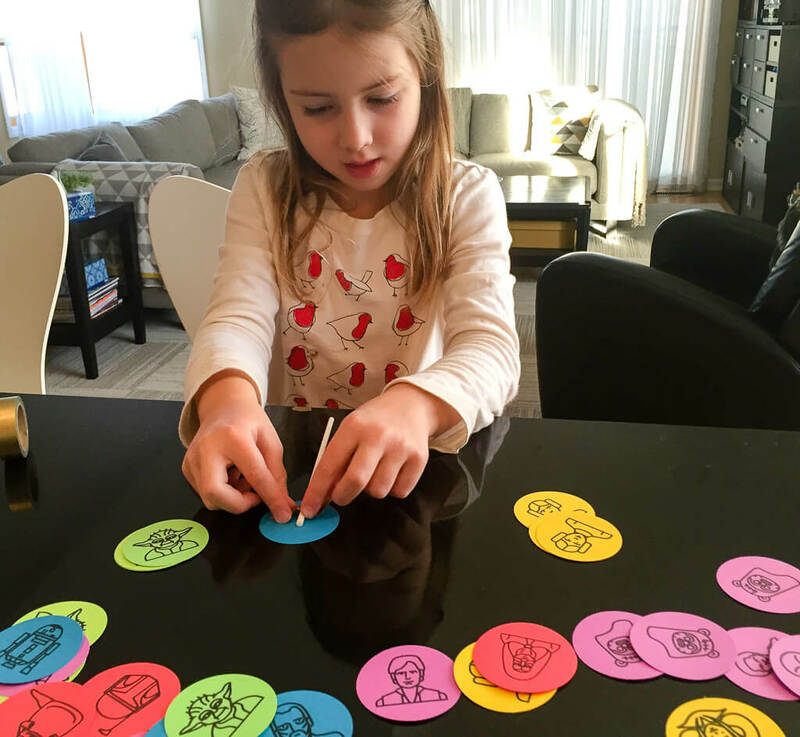 Punch out using a 2″ circle craft punch. 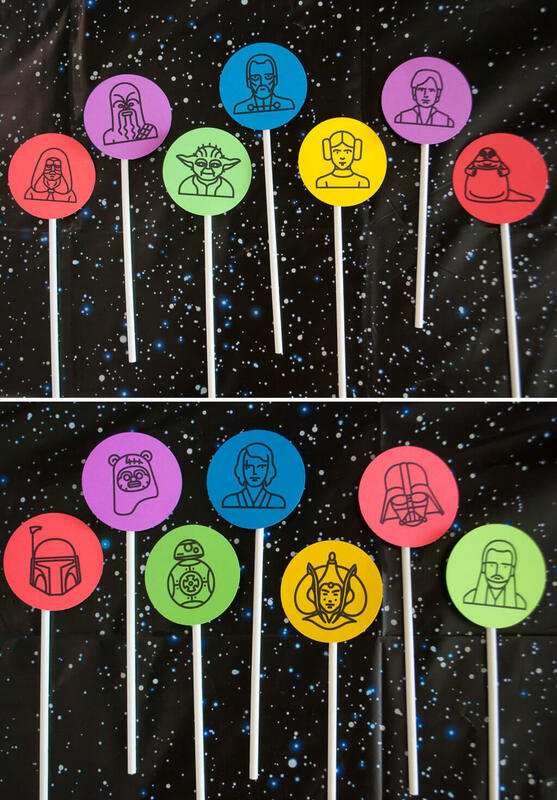 Attach to 6″ lollipop sticks using a bit of Washi tape. 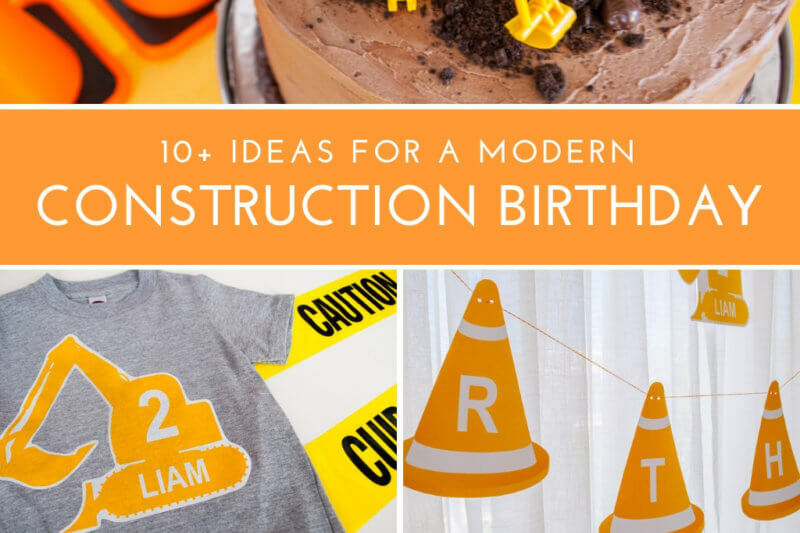 The birthday kid can do this step. 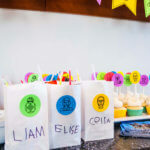 Bake cupcakes and let fully cool. 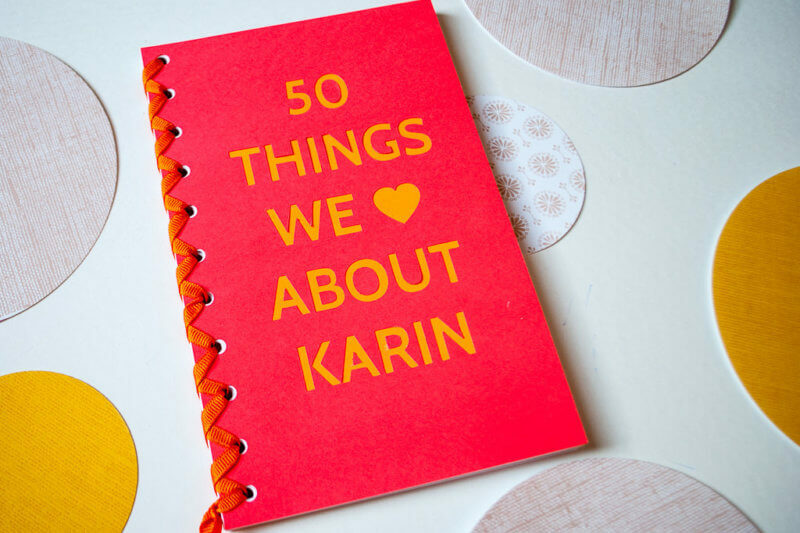 I like to use the Cakegirls vanilla cake recipe. 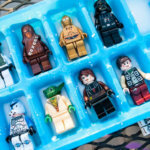 Ice with buttercream and top with the topper. 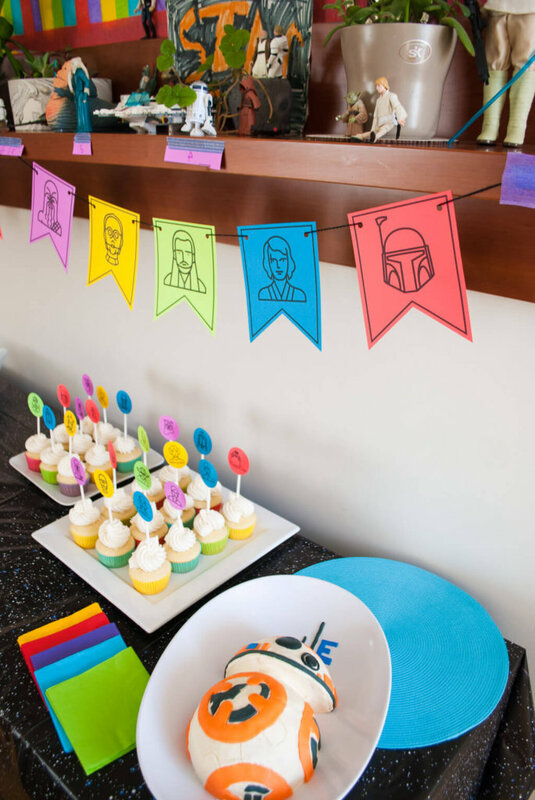 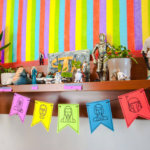 These colorful Star Wars cupcakes match my free printable Star Wars birthday banner and crepe paper backdrop, also in lightsaber colors, and Elise created a little Star Wars display of her toys that tell the Star Wars story by episode. 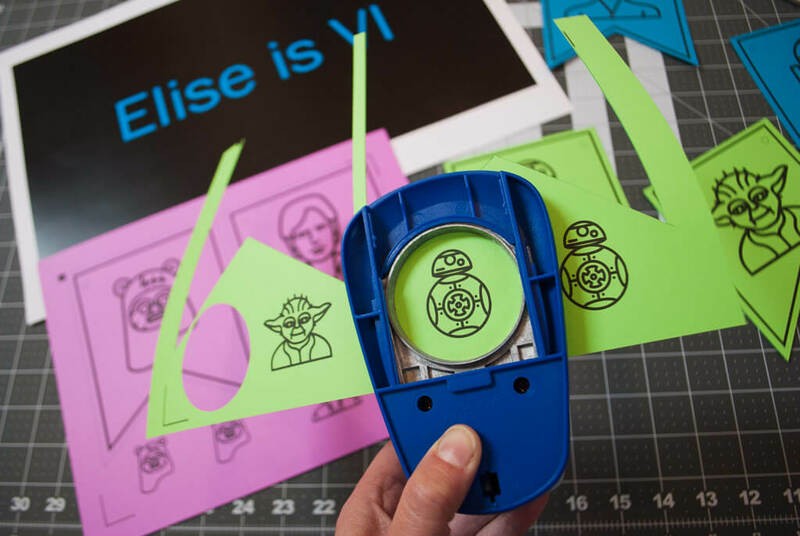 We also used these circles to decorate our Star Wars favor bags — Elise helped by writing guest names onto the bags. 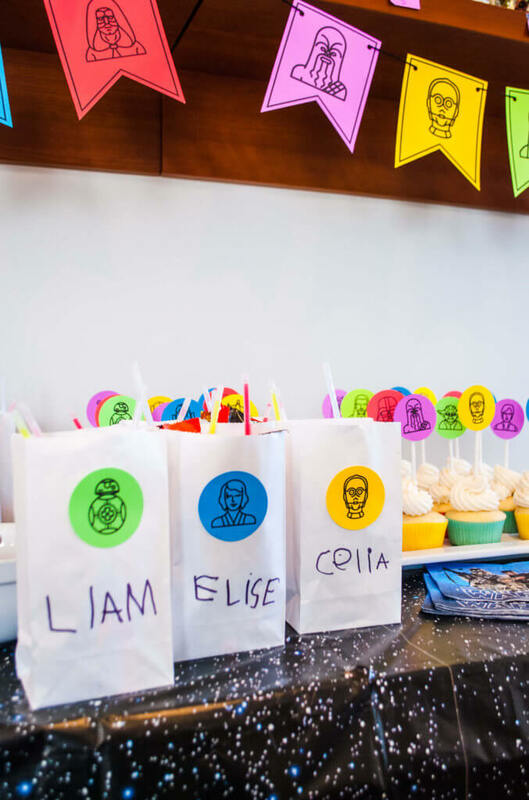 Inside the favor bags, we put lightsaber-colored glow sticks in red, blue, green, purple and yellow and LEGO Star Wars minifigures from the Save Han Solo From Carbonite Star Wars trivia party game. 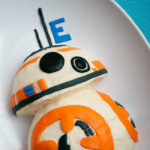 The Star Wars cupcakes supplemented my easy BB-8 birthday cake. 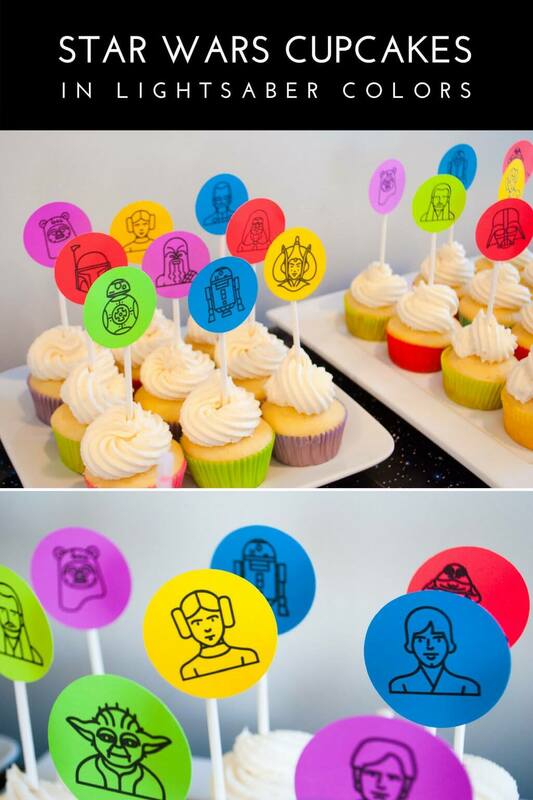 The BB-8 cake actually ended up serving quite a few guests so the Star Wars cupcakes were kind of a bonus treat.